One of our commonest species of snails in waters. It is an aquatic pulmonate or lung-breathing mollusc belonging to the Lymnaeinae family and it can be found in slowly flowing or standing fresh waters. 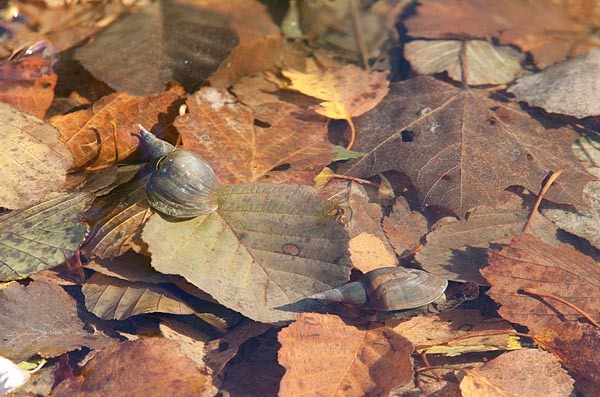 It moves in the water along aquatic plants and every now and then rises to the surface to breathe – as the description pulmonate, and the Estonian name kopstigu, lung snail, says. The shell can be up to five centimetres long, darkish-coloured on a living snail; an empty shell is yellowish-white and partly translucent. It is an omnivore – feeds on aquatic plants, dead fish, and as Arne’s photo shows, also on leaves of terrestrial plants that drop in the water.